The Viking LPR-1 auxiliary electronic ringer operates on any line that provides a minimum of 40 volts 20-30 Hz AC ring voltage. Nominal 3 KHz warble provides up to 92 dB SPL @ 1 meter. 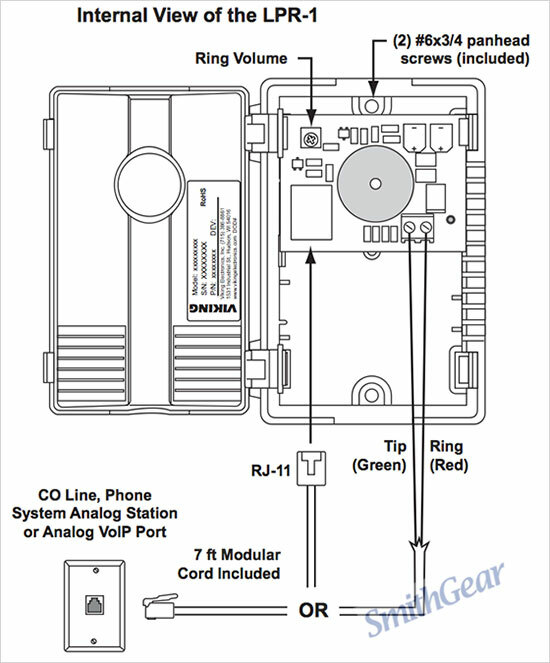 The LPR-1 can be connected via screw terminals or modular RJ-11 jack. A volume control and a 7 foot modular cord are provided. No power supply is required. Please NOTE this ringer is small (Just 3 inches wide) and is NOT DESIGNED for WIDE AREA COVERAGE. - Dimensions: 3.0" x 4.4" x 1.4"